(Chicago, IL) – July 28, 2010. It may be the dog days of summer, but Democratic state senate candidate John Mulroe (D-Chicago) is already on the political attack against GOP opponent Alderman Brian Doherty (R-41) in a race that is shaping up to be the hottest state senate contest in Chicago. Mulroe yesterday launched a broadside against Doherty criticizing the city council veteran for “his inability to deal with the city’s financial problems” as the city of Chicago’s budget faces a $700 million shortfall. Specifically, Mulroe is targeting Doherty’s support of Mayor Richard Daley’s deeply unpopular parking meter lease deal which has sent parking fees skyrocketing. “Selling our parking meters was a bad move, but already raiding nearly 85% of the money from the reserve fund that was supposed to last for 75 years was even worse,” said Mulroe. The company which leased the meters, Chicago Parking Meters LLC, paid the city $1.16 billion up front, but the money is now nearly exhausted, including the $400 million “long-term reserve” designated to replace the city’s lost meter revenue. Only $177.4 million from the deal remains. Doherty voted for the lease. Of the $771.3 million of lease money in the bank as of March 31, 2010, $543.9 million will be used to plug the city’s 2010 budget deficit. Asked to respond to Mulroe’s attack, Doherty responded, “If possible, I’ll give you a response tomorrow.” Tomorrow never came by our deadline. One of Doherty’s city council colleagues illustrates the political problem of the 75-year lease. Mulroe is obviously attempting to tap that vein of voter discontent in Chicago. “We have serious financial problems in Illinois and we need people that can be trusted to do the right thing with our hard-earned money,” said Mulroe, alluding to the meter lease. 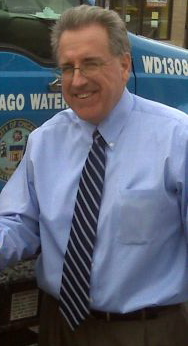 To repel Mulroe’s attacks on his parking meter vote, Doherty will need push his traditional “fiscal conservative” message hard to voters, but he has little money at the moment for direct mail with only $18,991.45 in his campaign warchest as of June 30, 2010—compared to $32,016.64 for Mulroe. It may be the dog days of summer, but there are only 96 days until November 2—and the meter is running. Brian Doherty: Where was Cool Hand Luke when I needed him. Dear David Ormsby, editor, I took the picture of John Mulroe and this was taken from my website http://www.chicagoclout.com. Please give me credit for the picture, you free to use it. Thank you again, Patrick McDonough. P.S. Keep up the great work!!! Thank you for your generous offer. Indeed, I will credit the photo to you.